Nations like Sweden find it easier to switch to the greener side, with lesser populations, more free space and plentiful natural resources, as compared to countries like the United States. Now, Swedish oil company OKQ8 has decided to turn its home greener with a gas station in the Sollentuna (Stockholm) suburb of Häggvik that’s termed to be sustainable. Using wood glulam beams instead of steel, a laminated timber of sorts, the material is known to be highly cost-effective when it comes to manufacturing and transporting it around. Also, the gas station will have a green roof and will sport solar panels to soak in the sun while a rainwater collection system will preserve water to serve the car-wash port! For those of you who’d like that perfect tanned look, though sitting out in the sun waiting for your skin to turn golden isn’t one of those activities you’d indulge in, here’s the perfect way to tan yourself. Now, ironic as it might be, this tanning salon is powered up by solar energy, using juice from the sun to power up all the equipment inside that gives you a healthy, though artificial tan. 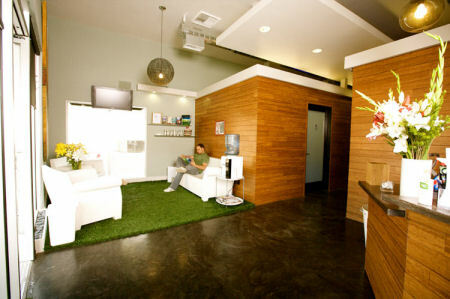 The Sunlounge Tanning salon, located in California, also makes use of bamboo walls and eco-friendly non-toxin paint while using a “tank-less” water heater that saves up on natural gas. We’ve got wind of Apple’s soon-to-open headquarters in Cupertino, California before. The spaceship-resembling building could now host one of the largest solar installations in the United States, with the roof spanning an area of a whopping 500,000 square feet that could all be topped with solar panels. And that’s not all. The parking space will boast 2,000 sq feet of photovoltaic solar panels, making this one of the greenest corporate facilities in the country. Also, Apple has made sure to keep the green in, with an increase of tree population in the area by 60% and reducing the use of asphalt by 90%. Shipping containers have been recycled before and put to newer uses post-retirement. This home in Canada is one of them, a perfect way to put to use those usually thrashed away chunks metal boxes. Called the Sea-Can Home, this one’s being put together by Bill and Rosanne Glennon and is still under construction. 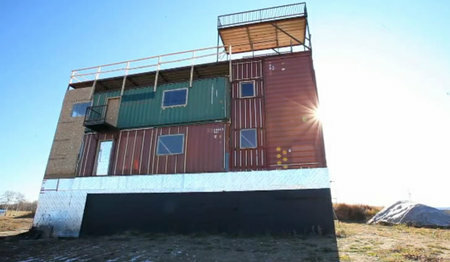 Once complete, this container-home will spread across 5,000 square feet and will serve as a retirement home, recycling 30 shipping containers in the bargain and making use of the wind and solar energy to power up. Blending together architecture and greenery, Italian architectural firm Stefano Boeri Architetti seem to have perfected the vertical garden design. 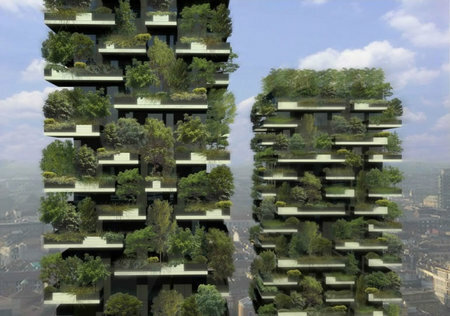 Called the Bosco Verticale (Vertical Forest) project, this solar powered structure by the Milan-based firm could be the answer to the green additions required in our urban spaces today. In cities growing vertically, spaces for green spots are rare and difficult to find. However, building vertical green areas could help save space and better the ecosystem in cities. The two residential Vertical Forest towers planned stand 110 and 76 meters respectively and will be home to more than 900 trees and will also include shrubs and floral plants! In all, these towers with 10,000 square meters of green will help produce humidity, absorb CO2 and dust particles, and produce oxygen with a budget of $87.5 million. Satisfying a woman with gifts, particularly your better half, isn’t all that easy. Men have been known to wander about shopping malls desperately trying to get their hands on stuff that’ll make their beloved smile. Well, when you’re a billionaire and you’ve got Naomi Campbell for a girlfriend, gifting her something from a mall isn’t all that good, which is probably why beau Vladislav Doroni came up with plans to build this Eye of Horus-shaped 25-bedroom luxury island house that’s astoundingly green. The dome-shaped home boasts a special cooling system that uses the principals of nature to keep the interiors cool even during summer. With photovoltaic panels integrated in the glass that surrounds the home’s dome façade, this home generates its own renewable energy. Londoners crossing the River Thames could enjoy some solar-poweredshade on the Victorian-era Blackfriars Bridge soon. The bridge is currently being hooked on to London’s largest solar roof and will soon begin soaking in energy from the sun to generate some green and renewable energy. A 6,000 square meter photovoltaic array is being installed on the Blackfriars Bridge and will make it the world’s biggest solar bridge when completed. The array is being put into place by Solarcentury and will generate a sweet 900,000 kilowatt hours of electricity on an annual basis, enough juice to power 35 homes! The next time you fly out of Kuwait, the experience could be a lot greener than you’ve ever had before. Foster + Partners architects are busy working on an airport design, that’s technologically ahead and is a green architectural marvel of sorts. With each terminal designed to sport three symmetrical wing-like structures, each of these will have a façade measuring 1.2 kilometers. The roof is of each terminal will pack solar panels and is looking for an LEED Gold certification. Nissan has given the world hope when it comes to transport and a roof above your head in a near-apocalyptic world. Unveiled at CEATEC Japan (Combined Exhibition of Advanced Technologies) 2011 the NSH-2012 Smart House is part of Nissan’s line of standalone community structures, including Smart Healthcare, Smart Cottage, Smart Rental Car and Smart Food Stand. Inspired by a modern aircraft fuselage design and ancient Japanese homes, the structure of this home is disaster-proof. And the best part of it all is the ever-green Nissan Leaf parked beneath, to ensure you get around on an eco-friendly set of wheels. We’ve had news of green structures being unveiled at the Solar Decathlon before, and the 2011 Solar Decathlon championship finally ended with the University of Maryland Water Shed winning first place. The competition had 19 prefab homes, all eco-friendly and green to the finish, competing with each other this year. With points awarded in 10 different categories, with each category worth a 100 points, the winning design, the Water Shed home, won the architecture contest and won a place in the first five in just about every other contest too! In all, the Water Shed home won 96 points for its amazingly green design that was crowned the best solar-powered residence from them all.